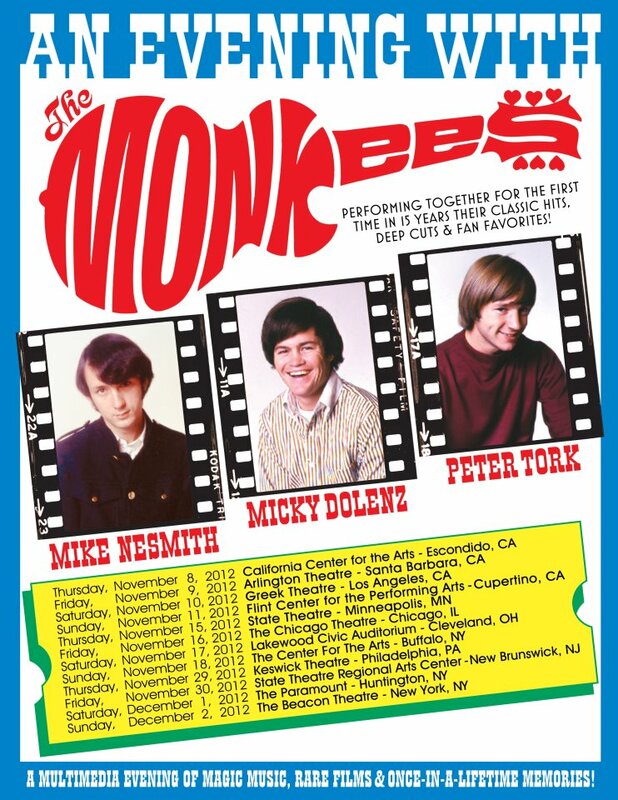 Surviving Monkees Michael Nesmith, Micky Dolenz, and Peter Tork return to the concert stage in November 2012 for a historic, 12-date tour of the United States. These performances will mark their first concerts together since 1997, and follow the unexpected passing of their musical comrade Davy Jones in February. Plans call for Jones to be saluted in the show’s multimedia content. The jaunt kicks off at Escondido’s California Center for the Arts on Nov. 8 and wraps at New York City’s prestigious Beacon Theatre on Dec. 2. They play the Arlington Theater in Santa Barbara Nov. 9 and the Greek Theatre in Los Angeles Nov. 10. The trio’s shows are set to feature a selection of their classic hits (such as “Last Train To Clarksville,” “I’m A Believer” and “Pleasant Valley Sunday”), deep cuts from their first five platinum albums (including some performed for the first time since the 1960s) and fan favorites from the soundtrack to their cult film classic “Head” and their Emmy®-award winning television series. The show will encompass a full multimedia evening of music, rare films and one-of-a-kind photographs. Since the dates fall 45 years after the band’s epic struggle to become legitimate music makers, the concerts will be highlighted by a set performed by just Nesmith, Dolenz and Tork. In 1967, the year they outsold The Beatles and The Rolling Stones, The Monkees released two No. 1 albums (“Headquarters” and “Pisces, Aquarius, Capricorn & Jones, Ltd”) which primarily featured the four as a self-contained, musical unit. This fall, each evening’s trio set will showcase numbers from these albums and present the electric garage band sound The Monkees developed on their mid-1960s tours. To open and close the show, The Monkees will be augmented by a stellar crew of players to play the hand-picked setlist each evening. 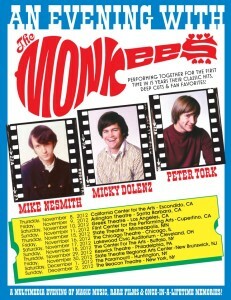 These dates are the first U.S. Monkees tour to feature Michael Nesmith since 1969. He has reunited with the group over the years; his last stateside concert with the band was a rare private show at Billboard Live on Sunset in support of 1997’s “Justus” album (I was there as Rhino Media Relations department co-director and shot the ancient digital photos archived here with a Kodak DC-40). Although Jones’ absence will undoubtedly be felt by The Monkees and their fans, his bandmates look forward to paying homage him, and to performing for their many new fans who have discovered their music through repeats of “The Monkees” TV show on Antenna television, continued play on classic rock radio, or via social media. It’s a must-see for all true Monkees fans.